Over the past few months I have heard numerous teachers talk about how poorly they are being compensated in Lee County. Like many citizens, I questioned that claim, knowing that much of teacher pay is mandated by the NCDPI salary schedule. So, I did a little digging this week. What I found helped me understand the angst from those teachers about teacher compensation. I am sharing it here. First observation– Lee County pays substantially less in teacher supplements than most counties, and far less than both Moore and Chatham counties, who are substantially wealthier than Lee County and both of whom spend more in the aggregate on public education than we do. Lee County pays 712 teachers an average of $2859 a year in supplemental income, as compared to Chatham County’s $4009 each for its 559 teachers, and Moore County’s $3535 each for its 827 teachers. Second Observation– Lee County pays substantially more in supplements to its principals, assistant principals, superintendent, and assistant superintendents than almost any other county in central NC. Now, we are not a wealthy county in comparison to many in our part of the state. But you would never know that by the very generous supplements we are paying our administrators. Our principals average almost $3000 more in supplemental pay per year than those in Chatham County and almost double the supplemental amounts of those in Harnett County. Our superintendent makes roughly the same in supplemental salary ($40,000) as the superintendents in Chatham, Moore, and Harnett– COMBINED! He has four associate and assistant superintendents whose combined supplements of $40,000 are greater than Moore County’s assistants combined ($38,379), and who make more supplemental income than their counterparts in Chatham and Harnett Counties combined ($32,048). When you assess the above two observations with respect to each other you cannot help but conclude Lee County decisionmakers value their adminstrators over their teachers. It’s just that simple. No other county has supplemental salary so perversely skewed as does Lee County. More pointedly, teachers are being shafted by their school administration and the Lee County Board of Education, and its high time they knew it. Here’s a thought: Why not have the principals, assistant principals, superintendent and assistant superintendents all be limited to the average supplement being paid to the surrounding three counties? After all, our teachers make less than the average of their counterparts in the neighboring counties. Another thought: Why not make a commitment to pay our teachers sufficient supplemental income to ensure their average total compensation is equal to any surrounding county? I know this sounds outlandish to budget hawks in this, a really horrible budget year. But if we make that a policy objective for next year and beyond, then the LCBOE and the LCBOC would have the time to analyze and deliberately divert the necessary funds from elsewhere within the school bureaucracy. Doing this would be great for teacher morale and give us a fighting chance to recruit and sustain even more outstanding teachers. As I indicated in the headline. The numbers don’t lie. They indicate what we value in our educational bureaucracy and they tell our teachers they aren’t as important as their paper pushing bosses when it comes to educating our children. This entry was posted in Budget, Education, Jobs & Workforce Development, Lee County Politics. Bookmark the permalink. Or, in the interests of fairness, how about everyone earning a supplement in Lee County simply makes 7 percent of their base? Regardless of position, you can make 7 percent more. Then we can go up when the economy improves, but start with the people closest to the students. Didn’t the original larger supplements come from the fact that the schools in the Lee County system were overcrowded? After all (if i may use a military analogy) a commanding officer leading a regiment has a much easier job than a commander leading a division. Is this something that was put in place years ago and never changed? Ten years ago we only had one high school and two middle schools (that where expanded and then filled to the point of bursting), it would be a lot more difficult to manage a school with fifty to eighty percent more students. Also if you look at Johnston County, which is in Triangle J Council Of Governments with Lee, you see that they have similar numbers. Their teachers get $3,642 to our $2,859, but their principals get $9,430 to our $7,022. They have numbers very close to ours, only slightly higher. Looking at the graph will show you that Guilford County principals are paid almost four times ($20,999) what the teachers make in supplemental payments, so our numbers are not the most off kilter in Old North State. Normally Lee County is often compared to Lenoir County when statistical information is discussed being that we are so similar in land mass and population. Teachers in Lenoir County get $1,069 to Lee County teacher’s $2,859, and principals in Lenoir County get $3,221 to Lee County principal’s $7,022. So (and i rounded all of this numbers to make this easier), Lee teachers receive a supplement of roughly 59% below principals, Lenoir teachers receive a supplement of roughly 67% below principals, and Johnston teachers receive a supplement of roughly 62% below principals. These numbers are very comparable. As to the matter of raising our average supplement to match Chatham County’s, I do not think that is enough of a pay increase to make anyone happy. On average we would go from $2,859 to $4009, that is only an increase of $1,150 per year. Now before taxes that would work out to be round about $22.12 a week, so after taxes maybe $16.00 a week. The teachers need more than that! I think improving the work environment would go a long way to make our teachers feel more appreciated. The community needs to make it’s feelings of thankfulness more openly felt. We cannot blame our teachers for not being able to educate children that do not have the proper background for learning or parents who simply do not care. How about this one…let’s pay our superintendent the same amount of supplement that Wake County pays its superintendent? That would seem fair! Where are you going with these comments? Are you saying that, for example, the $12,000 supplement for the principal of West Lee is justified? Based on numbers? West Lee is not the most populated school. And who are you to speak for teachers and say that you “do not think that is enough of a pay increase to make anyone happy” at the suggestion of matching Chatham county’s supplement. I think most teachers would be very grateful for an extra $1000 a year. Compliments are nice but they don’t pay the rent. I do not have a problem with that. I think the board of education and the county commission should also not take salaries and/or reduced salaries until this hard times are over. Let us have our elected officials step up and tighten their belts too. All I was saying was that Lee County’s supplemental numbers were not as skewed as being presented here. Are they perfect, absolutely not. Do we need to constantly work to improve and empower our school teachers and school system, yes we do. As to the matter of raising the average let’s go for it, but not every teacher is going to get a $1,150 raise. Some will get more some will get less (we are talking in generalities here when we talk in averages), but with just using the average it works out to be $22.50 a week before taxes. To quote myself: “The teachers need more than that!”. Is $22.50 a week enough to make you happy the rest of your life? Let us try to double the supplement. I think that would be a great idea. We just have to find the money, and have the political will to do what needs to be done. 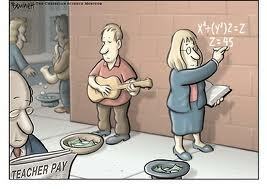 I think teacher’s need better pay, better benefits, and more respect in our society. Don’t you Mr Someone? I don’t believe however that all our problems come from Dr Moss and the BOE, and that the BOC are going to come and save us all. They all need to sit down and work this out together. Dr Moss could be fired and replaced tomorrow, and all the problems would be blamed on the next person. After all when did we ever have a Superintendent that we liked? Mr. Yow, You seem to assume that everyone wants the same as you do. I will not dispute how skewed the numbers may be but your basic assumptions. Empower teachers, maybe, empower the school system? I think they have too much power already. What is the turnover rate of Lee SS teachers? If it is higher than average is it due to pay or working conditions? I once found the results of an employee survey while browsing the net; the most striking result was the very low numbers of the employees willing to input their opinions. Let’s face some facts, the throw more money at the system approach has not had the desired results has it? You think the teachers need better pay, better benefits, and more respect, I disagree. Look to the private schools and the Home School students to see what can be done with much less money. It used to be a given that a person went into teaching because they wanted to work with children, the pay and job security was a nice secondary reason. I wonder if this is still true, it appears from the outside that today’s teachers would rather avoid the children and their main concern is money and power. I don’t know the local problems with Superintendents but some districts have had the same one for years and people are happy about it. Really, Someone else, both my sisters and their two daughters are “Special needs” teachers in two different states. One sister is footless and works with the physically handicapped her daughter works with “slow” children that have trouble with Spanish or English (she started as a ESL teacher) My other sister and her daughter work in a state that insists on “mainlining” all but completely hopeless students. They get to see their students “graduate” reading at the 4th grade level and able to do simple math if they are lucky. Apples & oranges, peaches and pears….. The focus should be on the taxpayers. Simply put, we’ve had enough of giving to a system that is so top-heavy with bureaucrats and not producing attainable results for the money they want! Public schools have the distinction of receiving ridiculous amounts of funding to educate all children. How hard can it be to teach someone to read and write in twelve years? Math is certainly an overreach of expectations. Oh, I forgot, you have to teach them foreign languages, how to surf the internet for test answers, how to paint (for that great NEA grant), how to play the tuba (for that sweet gig with the Philharmonic) and how to drop out. Oh look, it’s summer break, time to be heading off to my beach house. See you private school teachers, I mean taxpayers, in the fall. Spend a week in my classroom and you’d realize what a pompous, self absorbed idiot you actually are. You must be related to our esteemed superintendent…as only a gene matching ginge minge would say something so ignorant and just plain..STUPID. We moved to Lee County from a different state several years ago. The county we lived in had 11 highschools, 12 middle schools, and 33 elementary schools. The central office had 1 superintendent getting paid $170,000, and 5 assistant superintendents. We have 4 assistant superintendents for 2 highschools, 3 middle schools, 8 elementary schools, F.L.K., and Bragg Street here in Lee County. They functioned fine back home and trimmed the fat. Moss needs to trim the fat at the central office and start earning his outrageous pay by actually doing the work of one superintendent instead of outsourcing it to 4 assistant superintendents. Sidebar: I’m not taking any shots at our assistant superintendents. In fact, one of them should have been hired as the superintendent instead of Moss with his sketchy track record of ruining school systems. I would bet my pay check that at least two of the four assistant superintendents would have reduced their salary to save several jobs had they been superintendent. They would have showed solidarity and given the community a person to rally around in these trying times. Too bad the board got it wrong several years ago. We are all paying the price now!